The machine vision company's third-quarter earnings come during a weak period for the manufacturing sector, but can the company surprise with its guidance and outlook? Machine vision company Cognex Corporation (NASDAQ:CGNX) disappointed the market a quarter ago, and the stock suffered the kind of dramatic fall that occurs only when growth companies disappoint. Looking ahead to its third-quarter results must leave investors wondering what the company will say this time around. With this in mind, I thought I'd take a look at the five things investors should look out for when the company reports on Monday. The second-quarter results were solid enough. The real disappointment came from the outlook, which was significantly below previous estimates, and any failure to meet management's guidance range of $106 million to $109 million will surely hurt the stock in the third quarter. Gross-margin guidance in the mid-70% range is something else to look out for. 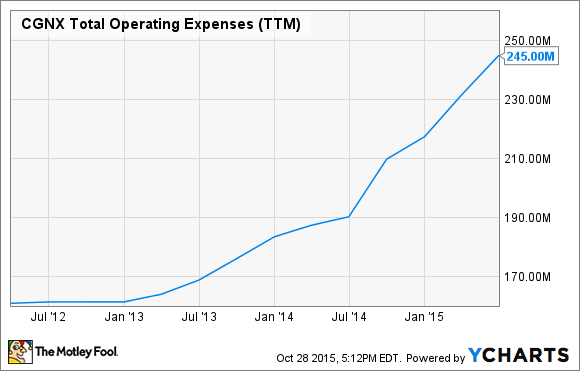 Beyond the headline numbers, investors should watch operating expenses. Will Cognex take action to cut costs? Revenue in the second half looks likely to come in short of what management expected at the start of the year, and operating expenses were ramped up 6% in the first quarter to support the expected order growth -- so it's reasonable to think that Cognex might try to manage expenses in line with reduced expectations for order growth. CGNX Total Operating Expenses (TTM) data by YCharts. The initial signs of weakness went back to the first-quarter earnings call, where CEO Rob Willett spoke of some "softening in the Americas." This turned into order delays in the second quarter. Given that many industrial companies have reported tough conditions in the last quarter -- for example, industrial supply company MSC Industrial Direct recently described the current environment as "difficult and deteriorating" -- it's difficult to see how Cognex will be immune. On the other hand, the automotive sector, alongside aerospace, has been an island of strength in the industrial economy in 2015, and automotive represents Cognex's core market. In addition, Cognex is exposed to secular growth trends such as the growing need for automation in manufacturing. Moreover, all it will take is a few large orders and the company will be back on track. Will these orders appear? Regarding orders, Cognex had previously hoped to sign some large orders in consumer electronics and logistics -- areas into which management is trying to expand its total addressable market. However, it's precisely in these areas that management intimated it had seen order delays. At the time of the second-quarter earnings, management suggested that some of these orders had been delayed into 2016. Naturally, investors will be focused on the order outlook and for more color on whether these deals are likely to close in early 2016. Ultimately, investors and analysts will want to know if anything has changed in the last quarter with regard to management's outlook on these deals. Clearly, the manufacturing sector has faced some headwinds in the last six months -- energy capital spending cutbacks, weak commodity prices, currency movements, weakening in China -- but Cognex's machine vision systems have good long-term growth prospects. Indeed, Willett expects Cognex's core factory automation business to grow at a 20% rate in the long term, with its ID products generating 30% long-term growth. It will be interesting to see if there is any adjustment to that viewpoint, because Willett's confidence in these kinds of long-term targets suggests that Cognex is merely adjusting to some near-term difficult conditions, rather than any kind of systematic risk. All told, it's hard to guess what Cognex will report. The manufacturing sector has weakened in the last quarter, but Cognex's core automation market is performing well -- at least outside China -- and all the company needs is a few large orders to close to put a positive shine on things. Some positive narrative on the potential closing of some of the delayed orders would be beneficial, too. 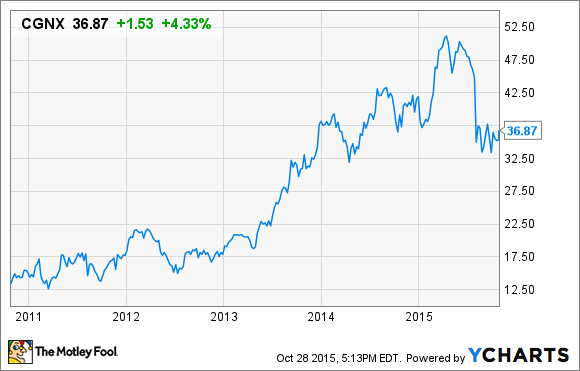 Cognex Earnings: Can the Company Get Past Macro Challenges?